Treatment involves wide local surgical debridement supported by intravenous antibiotics and other supportive treatment. It is essential that all areas of necrotic tissue be debrided, including direct visualization of infected tissue and radical resection of affected areas. Debridement is performed not only to control the primary infectious process but also to remove the necrotic tissue, which is the source of secondary infection as well as of toxin production. Fasciotomy incisions need to be planned according to the area involved; however, they should be parallel to the major blood vessels, thus maintaining the blood supply to the surrounding tissue. All involved fascial planes and head and neck spaces must be debrided and drained. Extension of the CNF after peritonsillar abscess or odontogenic infection to the layers of the deep cervical fascia can lead to involvement of the carotid sheath, cervical viscera, and deep neck musculature, with further extension to the mediastinum and anterior thoracic wall (17). 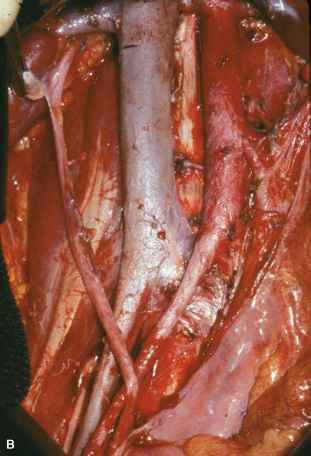 The infection spreads along the middle layer of deep cervical fascia. Characteristic of NF is the ability to dissect between fascia with little resistance. A finding during surgery suggests that gas and purulent fluid dissect into fascial compartments far away from sites of skin duskiness, crepitus, and fluctuance. Excision to the point of bleeding tissue is a useful guide for debridement. Although extirpation of the infected tissue may result in significant deformity, incomplete procedures are associated with higher rates of persistence, reoperation, morbidity, and mortality. Antimicrobial therapy directed against Gram-negative and Gram-positive aerobes and anaerobes (such as vancomycin and a carbapenem), in addition to high-dose penicillin G for treatment of clostridial pathogens, should be administered (18). Most patients should be returned to the operating room on a scheduled basis to determine if disease progression has occurred, so that serial debridement may be required. There are some centers which advocate the use of hyperbaric oxygen for treating this condition.